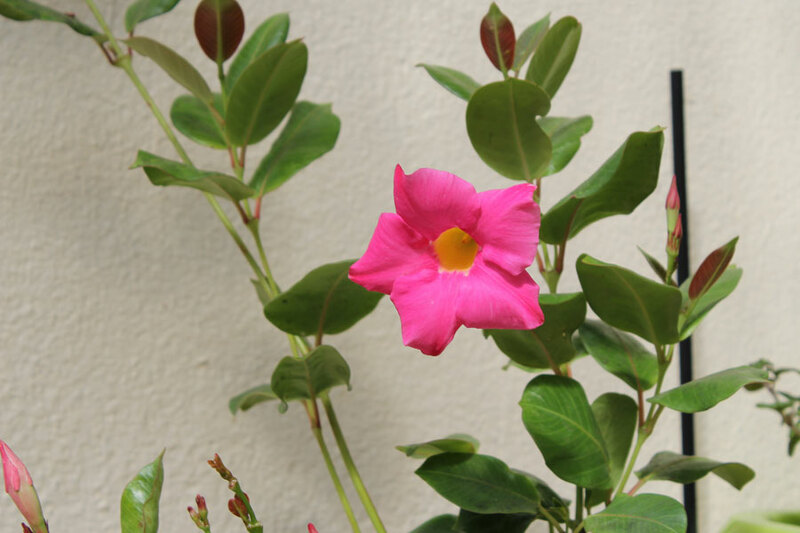 Note: Native to southeastern Brazil, Mandevilla splendens is an ornamental vine enjoyed as a garden plant in mild climate areas around the world. 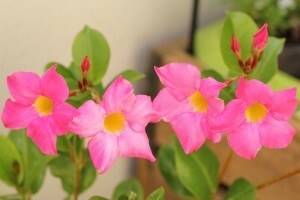 Mandevilla splendens is an evergreen creeper which climbs by twining and can grow to 3 meters high. It has wide green leaves of elliptical or rectangular shape which grow to 20 cm long. 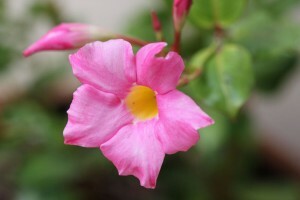 The flowers are pink or white with yellow centres, and it flowers from late spring to early summer. Flowering time: Mandevilla blooms heaviest in summer and sporadically throughout the rest of the year. Height: Mandevillas fuzzy stems will twine around supports eventually reaching a height of up to 3 m.
Foliage description: dark green, up to 20 cm in length and 8-10 cm wide. Light preference: Full sun for best flowering but will tolerate part shade. Midday shade is appreciated by plants growing in very hot climates. Watering: Likes adequate watering but can tolerate short periods of drought. Soil requirements: Likes a well drained soil. Fertilisation: Apply liquid fertilizer periodically during summer and you will be rewarded with ongoing beautiful blossoms. Pruning: Pinch off tips of new stems to induce dense growth. In early spring before growth begins, prune by removing old, crowded stems and shortening others. 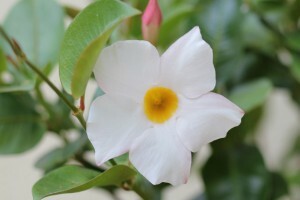 Even if pruned almost to the ground, Mandevilla will bloom again in the same summer on the new shoots. Diseases: According to Floridata it is relatively disease free. Propogation: Cuttings taken in summer will root within a few weeks. References: Floridata. Wikipedia and various books I’ve read. My Experience: I have found these plants super easy to grow and they reward me with non-stop flowers, even in winter when nothing much else is flowering. I have them in a pot and also now growing as creepers in a full sun position. It doesn’t get easier than this! Even when I forget to water them they just keep on flowering and growing. Highly recommended if you are new to gardening and want some instant gratification.